The American Independent Party, absent from mainstream state politics for decades, was once at the nexus of one of the most successful third-party presidential campaigns in history. The ultra-conservative group that has been quickly adding registered voters to its ranks was formed exclusively to help put then-Gov. George Wallace of Alabama on the California ballot. From its inception in 1967, the party was closely tied to the avowed segregationist and his White House ambitions. By that time, Wallace had already run one losing presidential campaign as a Democrat. So he decided to pin his fortunes as an independent with this new party, billing himself as the "angry man's candidate" during a tumultuous 1968 campaign season. "There's not really ten cents worth of difference in the two national parties," Wallace said in a speech to the new party's supporters on Aug. 3, 1968, according to a transcript in the California State Archives. "We are going to do away with this business of saying that government must choose for the people themselves." He billed himself as a law-and-order candidate, a hard-liner on national defense and a fiscal conservative. Then-Alabama Gov. George Wallace attempts to block racial integration at the University of Alabama in June 1963. Wallace gave virulent, pro-segregationist speeches as governor of Alabama, a state wracked with violence during the civil rights movement. During his first inaugural speech as governor in 1963, Wallace stood on the same ground where Jefferson Davis had been sworn in as president a century before and famously declared, "Segregation now, segregation tomorrow, segregation forever!" Once in office, Wallace made his infamous "stand at the schoolhouse door," attempting to block the integration of the University of Alabama with state troopers beside him. (National Guard troops, on orders from President John F. Kennedy, eventually prevailed in integrating the school). Two years later, Wallace ordered state troopers to block voting rights activists from marching to Montgomery, resulting in the violent clashes in Selma that became known as "Bloody Sunday." When Wallace turned his attentions to a second White House run in 1968, the Democratic establishment rejected his pro-segregationist platform. By forming a third party in a state with a large bloc of voters and extremely high barriers to entry, Wallace hoped to prove his mettle and win enough Electoral College votes to win the presidency. That meant Wallace had just months to get 66,059 Californians to sign up or switch their voter registration to the newly minted American Independent Party, so he could run. He predicted the effort would cost him more than $1 million. When it came time to choose a vice presidential running mate, Wallace even picked one of California's own: Gen. Curtis LeMay. Wallace spent weeks on end traveling up and down the state, speaking to voters in San Francisco, Sacramento, Los Angeles and Riverside. He shook hands with a Los Angeles police officer at Los Angeles International Airport, and called a long-haired hippie "ma'am" in Hollywood. Then he took his two daughters to Disneyland to celebrate his 49th birthday. 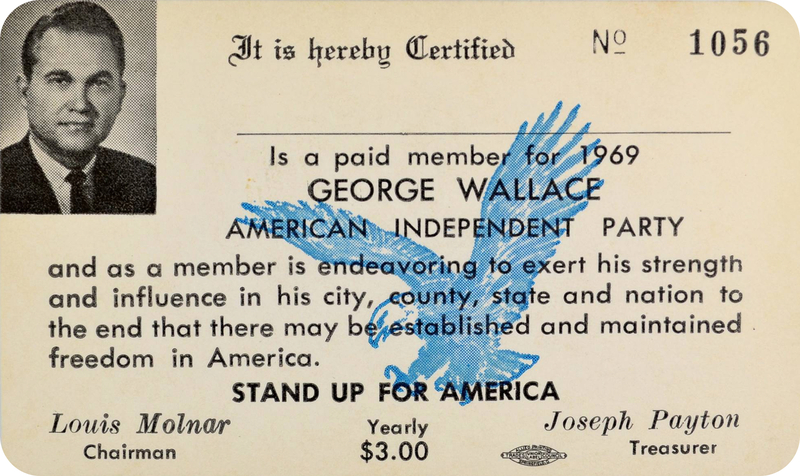 By November 1968, Wallace and his supporters had 94,000 new American Independent Party members. But Wallace wasn't well-received everywhere. He was heckled at appearances at UCLA and in San Francisco. During one swing through California in late 1967, he even brought along 16 Alabama state troopers to accompany him for the week of campaigning. By late 1968, Wallace appeared to grow weary and increasingly angry on the campaign trail, complaining about the media's coverage of his campaign, and canceling several Los Angeles TV appearances. "I see you got psychiatrists and sociologists and all the other 'ologists analyzing me," Wallace told a group of reporters. "Probably next week you'll have the zoologists analyzing me." He captured about 13% of the popular vote nationwide, carrying five Southern states. In California, he won nearly 7% of the vote. He told The Times in 1979: "In the next 50, 60, 70 years, when they write about third parties, they will write that we had the most successful, as of this date, third party movement in the country." In 1972, Wallace returned to the Democratic Party to run again for president, but his campaign ended after an assassination attempt that left him paralyzed from the waist down and using a wheelchair for the rest of his life. Wallace ran on the Democratic presidential ticket for the fourth and final time in 1976. Lacking Wallace as its focal point, the American Independent Party in California fell into discord. Hundreds of pages of documents in the California State Archives outline its tempestuous history, from frustration with election officials to bitter internal battles over leadership. Just two months after the 1968 election, state records show the party's membership was already shrinking. It didn't regain the size of its Wallace-era membership until 1980. Today, the leadership of the party disavows its Wallace roots. "We're not segregationist anymore," said Markham Robinson, a Vacaville resident who serves as chairman of the party's executive committee. "What we are now is a conservative, constitutionalist party." Staff writer John Myers contributed to this report. Page design and production by Lily Mihalik and Ben Welsh. The Times Investigation: Are you an independent voter? Not if you checked this box. Are you an accidental American Independent? Find out with our interactive database.